"We are very pleased with the prompt service and great finished products we receive from Prestige Monogram. You always take care of our sometimes demanding needs"
"We have been working with Prestige Monogram for years for our hats and jackets. Their products are beautifully and professionally made and their customer service is stellar. 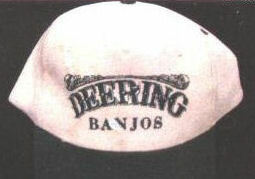 Our customers proudly wear their Deering Banjos hats. Thanks to the great folks at Prestige Monogram!" "We have been customers with Prestige Monogram for over 10 years. Their prices are competitive with uniform charges. We like the fact that we are supporting a local business and love the great personel Service. The turnaround time is always reasonable. Cathy always does an excellent job for us and takes pride in her work." "We have been very satisfied with the service we receive from Prestige Monogram. Although our orders are very small we receive the same professional treatment as the larger orders. Thanks for the great service." Want to share your thoughts about us? Just submit this simple form.